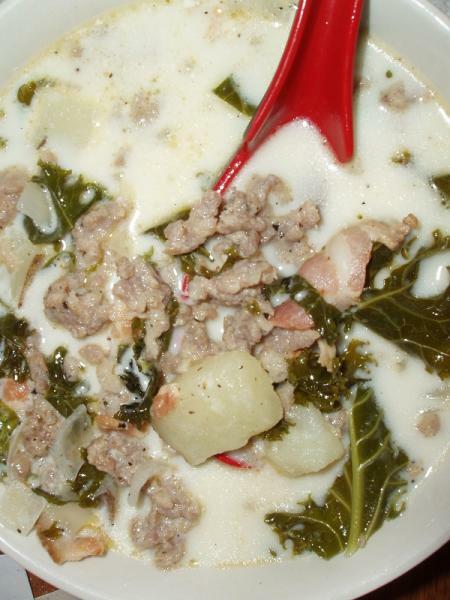 Zuppa Toscana Soup - Non Medicated Recipes - Ommp Pay It Forward - Portland Patients Helping Patients. In a skillet over medium-heat, brown sausage, breaking into small pieces; drain, set aside. In a skillet over medium-heat, brown bacon; drain, set aside. Place water, broth, potatoes, onion and garlic in pot over medium heat until potatoes are tender. Add sausage and bacon; simmer for 10 minutes. Add kale or swiss chard and whipping cream to pot. Season with salt and pepper; heat through.